Choosing a domain name for a business is an important decision. Should you choose a descriptive domain, long or short, use hyphens and which domain extension? Ideally the domain will be used for as long as a company is operational. 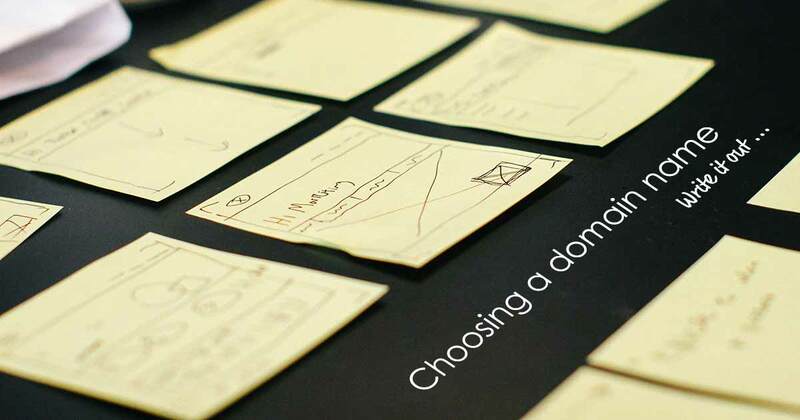 How do you choose the right domain name? Loosing trust signals from Google. Although it does not carry a huge amount of weight, Google uses the age of the domain name, and whether it has stayed registered to the same company as positive signals for a business listing. If you change domain name make sure you know where all your quality back links are coming from, and ask each site to change the web address once you have moved over. Search results if URLs are not redirected correctly. When a business changes domain name, but keeps the same website they are bound to lose link juice. Make sure, if you do change domain name and move the website across that all URLs have been individually redirected on a page by page basis. Sub-folders and deep content pages should also link to relevant content. Avoid redirecting all pages to the home page of the new domain. This is usually very easy to resolve. Re-direct your old business email address to your new one, and keep it that way for a couple of years (depending on how long you had the old domain). Cost in changing offline marketing. Make sure that you change all off-line marketing and branding products to the new website address. A change in domain name is easily rectified as long as you take the necessary precautions. However, correctly choosing a domain name in the first place will save some headaches. A domain name is a website address. Other common terms you might hear are ‘web address’ and ‘URL’ (Universal Resource Locator). Although URL is more commonly used for specific pages. How easy it is to type. How confusing it looks when it is written down, or whether it creates other words. If it reflects the website or brand well. How easy it is to remember. If the business will trade internationally. If the business will expand into other markets. i.e. reserving billsoutdoorfurniture.com rather than billsbenches.com if the company is likely to expand. Sometimes two words together can create a third, confusing word in the middle of the domain. Write domain name ideas down on paper or in a text editor like Word or Apple Pages. Stare at them. Say them out loud. Spell it out repeatedly. These exercises will help you spot any possible glitches. It’s generally better to stick to domain names containing between one or two words, however, as the web gets bigger, three or even four are acceptable. The following may help you to decide on the perfect domain name. Where possible strike a balance between a unique, brand-friendly domain name and a domain that contains a key term. The key term will highlight the product or service. If a company name is used in offline marketing, it should really appear somewhere within the domain. Keywords within a domain name once played an important part in helping search engine users to find a business. They now have little value on search rank, but could still be worth considering for marketing. A keyword, or key term, is descriptive and instantly interprets the company industry. Used on a sign or vehicle the general public can understand what the business does. Try to choose something that is meaningful but keep the domain as short as possible. Avoid domain names that exceed 16 characters. They are a chore to type, confusing when spelling it out, and is hard for people to remember. Saying that, whilst short names are easier to type, a domain name that includes full words, rather than abbreviations, will be easier to memorise. For example notonthehighstreet.com has been really successful, is easy to write and easy to remember. The .net can be depicted as someone who works in the industry and is not country specific. I did not use key words in the domain. The above points work for me because my company has moved from ‘web design’ to ‘ design and SEO’, and is now more international than UK based. Search engines used to register hyphens as spaces, e.g. snow-chalets.com would be seen as two words. These days search engines are more intelligent, and will easily parse out the keywords within the address snowchalets.com. Especially if a site is optimised well for key terms. Generally people are very used to typing ‘alloneword’ names. Plus the un-hyphenated names are easier to get across in verbal situations. If a potential domain looks odd when written down, hyphenated names can make it easier on the eye. The words can be distinguished. Try not to use more than one hyphen in a domain name, as the use of hyphens correlates highly with spammy behaviour. If the audience is a local community or delivery of the product will be within one country, it makes sense to use a country-specific domain suffix. E.g. .co.uk, .ca, .jp. If a site will benefit from an international audience, a .com is readily used. The .com domain extension was originally used for commercial companies, but is now recognised as international. Businesses of any size or industry can use a .com extension today. Some go straight for the “.com”, because their audience are very comfortable with it. The “.org” extension describes a non-profit organisation. A .net is usually used for a company in the internet industry. While .uk.ltd may be used if you are a limited UK company. In the end, the right domain name is a very personal choice. I hope some of the points made above will help your company with it’s decision. A UK based web hosting company, with great, personal, phone technical support 7 days a week 8am until 7pm. I cannot recommend these guys enough. However, compared to other ISPs, their ticketed support via their website is slow. Namesco offers domain names, email addresses, shared hosting, dedicated hosting, SSL certificates and more. Namesco have a really good up time, being 99.9% over about 15 years now. Well priced domain names and renewals are available from this web hosting company, also based in the UK. Their technical support by email is really fast, someone is always available to help you out. Also offering web hosting, email accounts and SSL certificates. Go Daddy are a web hosting giant, and services are less personal. However they are efficient, cheap and useful if you want to reserve domain names with unusual suffixes. They have websites/control panels for a multitude of countries and languages. Based in the US and Europe, Siteground have excellent technical support via their website using either a ticket system, or chat. Either way, they respond really quickly.